Vivekananda International Foundation: Mandate 2014: Why the BJP Won and the Congress Lost? Mandate 2014: Why the BJP Won and the Congress Lost? The 2014 elections will certainly be considered a landmark in the Indian polity because of the manner in which the two main antagonists, the Congress and the BJP, went into battle. Whereas for an actual battle, the Order of Battle formulated by the contending commanders is of great importance, of even greater importance is the political structure of the country and the organisation of its armed forces. For example, Germany entered the Second World War holding the advantage of greater preparedness, clear-cut objectives and the best tactical use of manpower and equipment. That is why Germany met with initial success in which Europe lay prostrate at its feet and the Soviet Union received the hammering of its life. In the first two and a half years of war, Germany went from victory to victory. But it was not only a dictatorship, its Fuerher was a megalomaniac who, so long as he was victorious, gave his Generals a free hand, but when any crisis occurred all rationale was thrown to the winds, all decision making even of a tactical nature centred in Hitler and, having surrounded himself with a bunch of yes men such as General Keitel and General Jodl, all professional advice was brushed aside and the most irrational orders were issued from Hitler’s headquarters. The defeat at Stalingrad and the surrender of three and a half lakh German troops under Field Marshal Paulus was a direct consequence of Hitler’s stupid policy and absolutely idiotic orders to Paulus. A stage came when, as Churchill put it, “Before Alamein we won no victory and after Alamein we suffered no defeat”. That is because Britain, with its democratic tradition, evolved the military strategy and tactics which enabled the commanders in the field to take on the Germans on their own terms and defeat them. A democracy will always bounce back after initial setbacks; a dictatorship cannot survive a disastrous defeat. But why talk of war when one is discussing the electoral struggle between the Congress and BJP? For this, it is necessary to take a look at how the Congress is organised. The party founded by Hume and later welded into an unbeatable weapon for fighting against the British for our Independence by Mahatma Gandhi was based on a leadership in which the Mahatma created around him giants like Sardar Patel, Jawaharlal Nehru, Maulana Azad, G.B.Pant, B.G. Kher, Morarji Desai, C. Rajagopalachari, Dr. B.C. Roy, Gopinath Bardoloi, Rajendra Prasad, Lala Lajpat Rai and other stalwarts who gave the party stature, strength and a structure in which everyone had a voice. To lead India to Independence and then to democracy was the task that the Congress performed, but only because it was a party which embraced all. In his own way, the Mahatma was also a dictator when it came to matters of fundamental principles in which he believed. On Ahimsa and Satyagrah there could be no compromise. But he was also a great democrat in that he was aware of his own fallibility and not only heard people but atoned for every mistake he made. That was the greatness of the Mahatma and of the Congress Party. For the first twenty years after Independence, it was the Mahatma’s Congress which ruled India. Jawaharlal Nehru was the son of Motilal Nehru, but Motilal did not found a dynasty because Jawaharlal Nehru came to power not on account of birth but by voluntarily embracing the role of a freedom fighter, which won the heart of the Mahatma, who virtually counted on him as his successor. The Mahatma’s word carried great weight, but ultimately Nehru came to power through a democratic process and he stayed in power till 1964, a total of seventeen years, because the people elected him. No doubt Indira, his daughter, became the Congress President during Nehru’s lifetime, a step which Nehru could probably have avoided. However, she did not become Prime Minister on Nehru’s death because first Gulzarilal Nanda pro tem and then Lal Bahadur Shastri through the party’s choice became Prime Minister. Indira became Prime Minister only after the unfortunate demise of Lal Bahadur Shastri at Tashkent. Undoubtedly being Nehru’s daughter helped, especially because the Kamaraj Plan had eliminated people like Morarji Desai, but nevertheless this was not a dynastic succession. At what stage did dynastic succession overtake the Congress Party? In 1967, when the country went through a period of purchase of power through corruption, United Front governments were formed and in the case of Madhya Pradesh. at least had the blessing of Indira Gandhi who did not like D.P. Mishra, the M.P. Chief Minister did not mind his displacement. Politics took a very ugly turn because power suddenly became a commodity instead of a means of service and like all commodities, power too became purchasable. That marked the beginning of complete and absolute commercialisation of politics and the introduction of widespread corruption across the board. The J.P. movement of Sampoorna Kranti (Total Revolution) was a direct reaction to this and as a consequence thereof, as a means of self defence, Indira started looking for support within her own family because she did not trust her own party leaders. Her natural choice was her son, Sanjay and it is not necessary for us to recount here in detail what this led to, culminating in the proclamation of Emergency under Article 352 of the Constitution and Indira’s attempt, at the behest of her son, to introduce authoritarian rule just short of an outright dictatorship . This attempt failed because our Constitution was too strong to be destroyed by such extra constitutional means and the institutions which we inherited from the British, the Civil Service, the Judiciary and the Armed Forces by and large stood firm and prevented authoritarian rule from degenerating into absolute rule. For this we must thank the British who gave us such institutions, which came under immense pressure, which sometimes succumbed, but ultimately recovered enough to force Indira Gandhi to hold elections in 1977, at which she was defeated. On return to power in 1980, after losing Sanjay in an air accident, Indira turned to her elder son, Rajiv Gandhi and brought him into politics despite his initial resistance. With Sanjay followed by Rajiv, Indira Gandhi was well on the way to establishing dynastic rule within the Congress Party. The entire top leadership of the Congress Party was decimated and replaced by sycophants and courtiers such as Debakanta Barua, or by leaders who would never resist Indira Gandhi, nor give her unpleasant advice. The party’s democratic structure totally eroded because now it had become the personal fiefdom of Indira Gandhi and her family. Sanjay certainly had no democratic instincts and inhibitions and though Rajiv was more gentle and gentlemanly than Sanjay, he was caught in a web in which despite his pronouncements that he would rid the party of sycophancy and restore a democratic structure, the courtiers who surrounded him ensured that he was never able to do so. 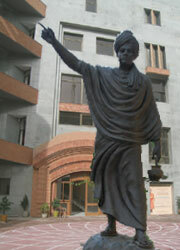 Barua had chanted the slogan, “India is Indira, Indira is India”. Now the slogan in the Congress Party was that the party centred around Rajiv Bhaiyya only. Under these circumstances, a grass-root leadership can never evolve. After Rajiv was assassinated, the Congress, instead of reinventing itself as a grass-roots party, fell back on Sonia Gandhi, his widow. She, in turn, brought her son, Rahul into politics and the chorus from that day has been, “Sonia is our leader and Rahul must be Prime Minister”. Occasionally fluttering her wings on the sideline is Priyanka, Sonia’s daughter and now the effort is to bring her into a leadership position in the Congress. This slightly long analysis has been done because the Congress Party went into the 2014 general election not as a democratically structured party but as a caucus, a clique, a coterie of which Sonia and Rahul were the leaders and everyone else was the willing servitor. That is why the campaign of 2014 was so heavily dependent on Sonia and Rahul and there was virtually no other known and respected face of the Congress as a leader of the campaign. In a way we could state that the Congress went into the fray not as a party but as the jagir (fiefdom) of the Nehru-Gandhi family. What is why the tried and tested shibboleths which were used more than forty years ago were repeated instead of being discarded, including the one which advocated that the Muslims must come together and vote against the BJP, which is a “communal” party. Whereas this failed to completely polarise the Muslim vote, it certainly led to a reaction from a section of the Hindus, resulting in a marginal polarisation of the Hindu vote. Even a marginal polarisation of 82 percent of the population represents a huge number and this doomed the Congress campaign. Had there been a wide-based Congress leadership, it would have advised against such tactics and the Congress would have put up a much better showing. The problem with the Congress Party is that it has no one to give sane advice or ask the questions which could force the party to do rethinking on its leadership. No Congressman dares to suggest that Sonia Gandhi is simply not up to leading a major national party because she has neither the charisma of Indira Gandhi, nor the organisational skills of Sardar Patel, nor the popular backing of Jawaharlal Nehru. An objective analysis would have done to her what the Conservative Party did to Margaret Thatcher. She would have been advised to step down. When the Labour Party had a series of electoral defeats that party opted for young Tony Blair to lead it and he virtually reinvented the Labour Party. When, however, the Labour Party felt that Tony Blair was no longer at his best, it forced Blair to step down and selected George Brown as Prime Minister. That is how a democratic party functions. Had Congress been a party and not a clique, questions would have been raised about the manner in which Rahul Gandhi led the election campaign and he would have been asked to step aside. Instead, Congressmen are falling over each other in begging Sonia and Rahul to lead them. Unless the party reinvents itself, by 2019 it would have made itself irrelevant. The other antagonist, the BJP, went into battle with a completely different strategy. It became clear that the old guard of BJP had outlived its utility. This included L.K. Advani, Murli Manohar Joshi, Kalyan Singh and other old leaders who had failed to deliver in the past and could be depended upon to fail in the future. Because the BJP did not carry the dynastic baggage of the Congress, it could take an objective view of its leadership. That is why in Rajasthan a ticket could be denied to Jaswant Singh despite his seniority and when he walked out of BJP, the party could find a candidate not only to replace him but to defeat him in his own constituency. Had sentiment ruled, had emotion been given play, Jaswant would never have been denied a ticket, but in politics there can be no room for sentiment and emotion. Here there is room only for hard headed reality. Obviously, not being tied to the apron strings of a particular family, the BJP could take an objective view and take hard decisions on leadership issues. Much doubt was expressed by our media and others that if the senior leadership of BJP was ignored or sidelined there would be an internal revolt and the party would be crushed during elections. That did not deter BJP. How did BJP get this strength to change the entire top leadership? The mentor of BJP is RSS. RSS has always denied that it has a political face or is openly involved in politics. It has always contended that it is a socio-cultural organisation which wants to restore pride of the people in the nation, encourage nationalism and, incidentally, protect Hindu interests. RSS has close links with BJP, most of whose top leaders have a RSS background. It is the general refrain of those who are anti RSS that RSS actually determines every move of BJP and that in government it calls the tune. RSS has always denied this. However, the fact remains that whereas a BJP Chief Minister may not totally ignore the RSS, that organisation, in turn, does not try and impose its will on a daily basis on how the government conducts itself. One great advantage that BJP has over the Congress is that RSS is the mentor, which has kept itself outside the details and nuts and bolts of BJP politics. Therefore, the emotional bond that Congressmen have with the Gandhi family has no place in the RSS – BJP system, permitting the RSS leadership to take an objective view of matters pertaining to BJP. That is why when L.K. Advani returned from Pakistan after making a controversial statement on Jinnah, he could be summoned to Nagpur and advised to step down from the presidentship of BJP. Advani had to obey. That is why the present RSS leadership could do a review of the BJP old guard and come to the conclusion that the time for change had come. There was a new generation of voters and that generation did not relate to the old leadership of BJP. Under goading by RSS, BJP had no option but to take hard decisions about the replacement of the old leadership by a younger group led by Narendra Modi. Modi was not necessarily the first choice of RSS because he has an independent streak in him, but because the RSS leadership was objective, it accepted Modi without reservation. The result has been spectacular. RSS gave to BJP its large army of grass-root workers who spread into the field right down to village level. Modi gave a message of development and hope which appealed to voters across the board, especially to the young. BJP went into battle not only with a well thought out order of battle but also with its formation commanders and its unit commanders right up to the last unit being properly briefed, motivated and trained. There could be only one outcome to the battle of Alamein, with victory going to Montgomery. In 2014, Modi was Montgomery but unfortunately Rahul was not even a shadow of Rommel. In battle he was a wraith, a pale shadow and Congress has paid the price for its own unfortunate blindness in waging a war under a leadership which is no longer relevant. When will the Congress have the objectivity to realise this, eliminate a failed leadership and bringing people of the calibre of Tony Blair? When will Congress reinvent itself? Right now it is game, set and match to Narendra Modi and his party. One wishes the new government success in dealing with India’s problems and leading us along the path of progress and prosperity. But for the sake of democracy, for a middle of the road benchmark, Congress must revive itself. If Sonia and Rahul are really as patriotic as they claim, they must step down and let a new, dynamic team, firmly rooted in ground realities, take over. However, Modi and BJP can rest easy for in the near future the Gandhi family is unlikely to retire and the Congress to see sense.